"Hey, Mac! Someone threw away this perfectly good fishing stick!!" Mac and Mac, the Noodlehead brothers, aren't too smart, but they know a fishing rod when they see one. "I wish we knew how to fish," said Mac to Mac. "We can learn," said Mac to Mac. That's a dubious statement, but first the not-overly-bright brothers have to figure out how to get the fishing rod home to show to Mom. Carrying it horizontally, they soon discover that they can't get it through the opening in the hedge around their house, until Mac finds the solution and breaks the rod into two pieces. Now it can catch twice as many fish! Mom is only too happy to shoo her little noodleheads off for an fishing expedition with sack lunches, and suggests they find some water and look for a school of fish. Fish go to school? They must be smart. "Wait! Fish live in water?" The Macaroni twins have a lot to learn about fish and fishing in Tedd Arnold's latest, Noodleheads Find Something Fishy (Holiday House, 2018). Multiple award-winning author-illustrator Tedd Arnold, His Royal Highness of Humor and the Sultan of Silliness, has kept beginning readers giggling for decades, and in this title he serves up platesful of silly verbal and sight jokes in his Noodleheads series. In this latest in series, Arnold reinforces his reputation as the Nabob of Noodle Tales. For this one, folklore storytellers Martha Hamilton and Mitch Weiss provide age-old noodle tale tropes and Arnold supplies the silly illustrations shown in comic book style panels and in easy-reading text. Despite their, er, ill-conceived schemes (or perhaps because of them), Mac and Mac are Theodor Seuss Geisel Honor Award winners for their Noodleheads See the Future. 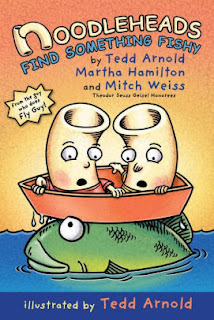 Arnold is also the author-illustrator of the famous Fly Guy series of beginner readers (see reviews here), as well as classic fun books such as No Jumping on the Bed! Parts (Picture Puffin Books), and Van Gogh spoof, Vincent Paints His House. "A must-buy for graphic novel collections," says School Library Journal'sstarred review, and Kirkus Reviews puns "Fans won't want to miss the boat on this one."